When you are carrying a large debt load and living paycheque to paycheque, and can’t pay your bills, it can be a real challenge. As your debt load grows, or if you experience a sudden change in your income because of a job loss or illness, there may arrive a day when you are no longer able to pay those bills. What then? First- don’t panic. Second- develop a plan. “That moment when you realize that your income just isn’t going to be able to cover your debt commitments is overwhelming. A very common reaction is to ignore the situation, hoping that things will change or that the debts will somehow disappear,” Jeff Schwartz, executive director, Consolidated Credit Counseling Services of Canada. “The only way to get rid of that anxiety is to take charge. The longer you wait to own your situation and develop a plan, the more challenging it will be to achieve your goal. Not only are you continuing to accumulate interest, you are letting your worry grow as well,” says Schwartz. Can’t pay your bills? Here are some tips on how to take charge of that debt load- and of your life. When you recognize that you can’t pay your bills, you’ve got to identify the essentials. You need to cover shelter, food and utilities. Once you’ve determined how much that will take of your available income or savings, you go from there. 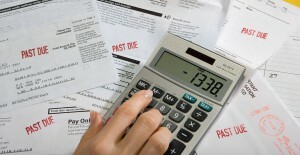 At all costs, avoid using credit or other debt tools to pay your bills. You’re only going to make that debt cycle churn faster. Don’t wait in dread for your creditors to call. Perhaps the most important thing that you can do is to proactively reach out to them to communicate your difficulties. They may have a number of options available to you (debt restructuring, interest relief, payment forgiveness/skip a payment) depending on a number of variables, but you won’t know unless you reach out. Depending on your options, you may be able to develop a plan with your creditors to help. No matter what has caused your debt problems, you don’t have to endure the stress alone. Turn to friends and family for emotional support. You may also want to seek professional support, from a financial advisor or from a trained credit counsellor who can help you understand your options and help you chart your path towards financial health. If you can’t manage your debt load, you’ve got to take steps to shift your household budget so that it fits within your limits. On the income side, consider taking on a part-time job or selling some of your belongings in an effort to open up cash flow. On the expenses side, be ruthless in slicing and dicing your spending. Cut out all unnecessary spending and look for additional ways to save (e.g. carpooling, smart grocery shopping with coupons and sales, etc.). If you stick to your budget and to your overall financial plan, you will eventually return to stable ground financially. However, don’t make the same mistakes over again. Only spend within your means, avoid taking out new credit and let your household budget be the guide. Have your bills completely taken over your life? Are you running out of options? We can help if you reach out. Call us at 1-888-294-3130 or check out our free online debt analysis.